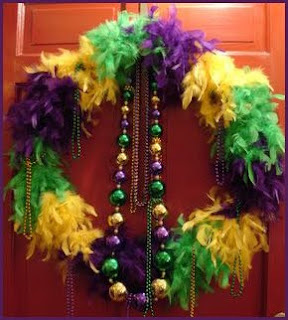 Party Ideas by Mardi Gras Outlet: Fun Mardi Gras Wreaths for your door! 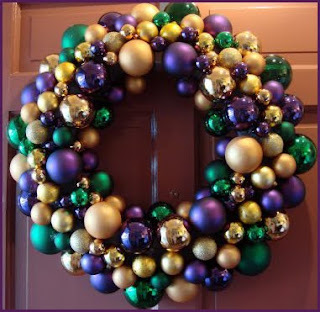 Fun Mardi Gras Wreaths for your door! Looking for some inspiration for your Mardi Gras door decorations? MardiGrasOutlet.com carries a few styles of ready made wreaths in the Mardi Gras colors: purple, green and gold. Instantly decorate your door with one of these wreaths. 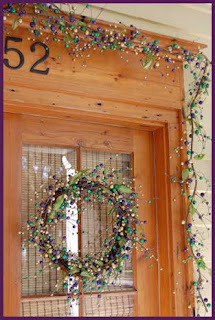 Add a coordinating garland to the header of your door for a complete look. Feeling crafty? MardiGrasOutlet.com carries tons of supplies to craft your own one of a kind Mardi Gras wreath. Here are some pictures to inspire you! This Berry Ball Wreath and matching garland are elegant. These have a more upscale look with the subdued matte purple, green and gold color. Add a Mardi Gras ribbon bow to the wreath and garland at the corners of the door header for another punch of color. Don't know how to make a bow? We have a photo tutorial and a video tutorial on how to make bows from poly deco mesh. If you want to go for true Mardi Gras glamour, choose the Mardi Gras Greenery Wreath with lots of metallic flash. This wreath has sparkly mylar tinsel branches wrapped around it in all three Mardi Gras colors. Pictured here are two more fun styles of a Mardi Gras wreaths. A creative southern girl's blog Deep Fried Kudzu shows how anyone crafty could assemble these Mardi Gras wreaths. I loved the finished wreaths. I think they are definitely worth the time spent crafting them. Check out this blog http://www.deepfriedkudzu.com/2008/01/mardi-gras-wreath-ornament-wreath.html to see great "how to" pictures for these two Mardi Gras wreaths. Not feeling crafty today? The ornament wreath can be purchased here. Mardi Gras Outlet also offers a smaller 16 inch version of this wreath. Any of these Mardi Gras wreaths could be personalized with your own unique style. Add ribbon, ornaments, beads, garland, masks or floral picks to each wreath for a one of a kind creation. Your options are endless. We took the basic Metallic Mardi Gras Greenery Wreath and transformed it 3 different ways. Click here to see the blog post detailing how we did it! Twelfth night rings in a King Cake tradition!